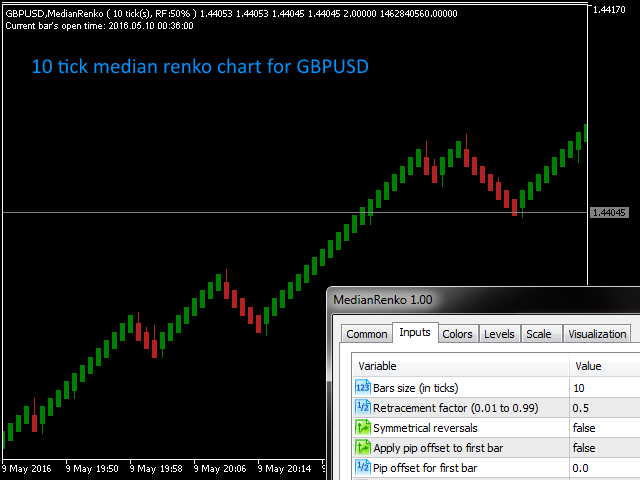 Robust median Renko style indicator for creating custom charts resembling Median Renko, Mean Renko, Turbo Renko and Better Renko candles as well as vanilla Renko with wicks plus Point-O charts. This all in one package provides all of the signals needed by day traders, scalpers, and even long-term traders. The indicator is an overlay on the main chart so it is possible to utilize one-click trading and order manipulation directly on the custom charts. Visual order placement is also possible. History calculated using real tick data. Built-in technical studies: 3 moving averages (Simple, Exponential, Smooth, Linear-weighted, Volume-weighted using tick volume or real volume), Bollinger Bands, Donchian channel, Super Trend. Price level indications for current bar close levels, which are conveniently displayed to the right of the current bar. Optional display of monthly, weekly and daily pivot levels. Optional display of daily R1, R2, R3 & S1, S2, S3 resistance & support levels for the current trading day. 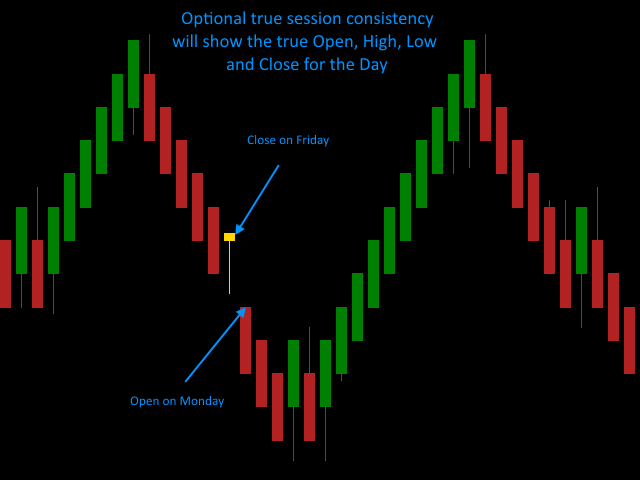 Optional display of previous day's high, low and close levels. Optional ATR based bar size calculation. 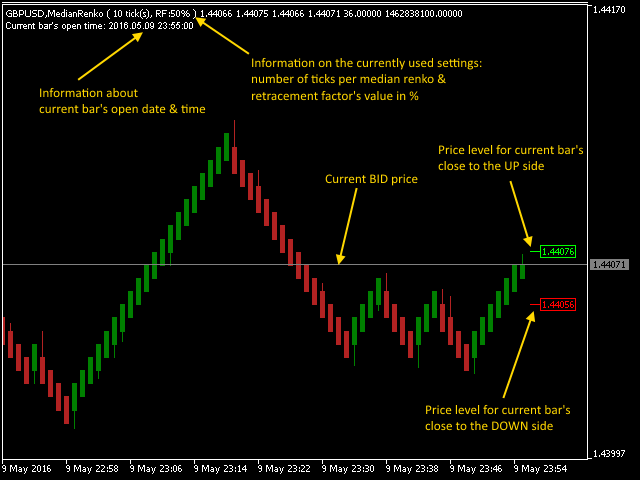 Optional first Renko open offset. Audio, Push notifications and text alerts for new bar open events and/or reversals (different audio files can be assigned for bearish and bullish reversals). Convenient display of current bar's open date/time along with bar size and retracement factor information. Color indication of last day's bar for easy history assessment. 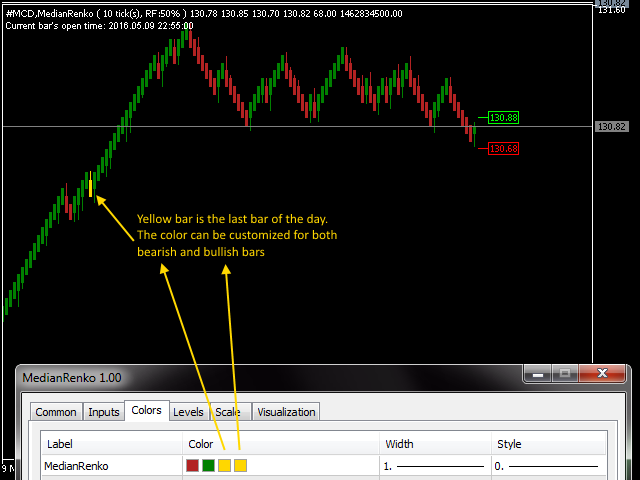 Color markup of phantom Renko bars (gaps). Each bar has its own info regarding the bar's Open, Low, High, Close values, as well as the Tick Volume, Real Volume (with breakdown of buy/sell volume) and Bar open time for use by EAs (saved as double in indicator's buffer and available via dedicated Data Window). A dedicated data window is displayed when left-clicking a Renko bar while holding down the CTRL key. Retracement factor (0.01 to 1.00). ATR based bar size calculation (user editable ATR period and percent of daily ATR value used for bar size calculation). Show history for defined number of days (plus current day). 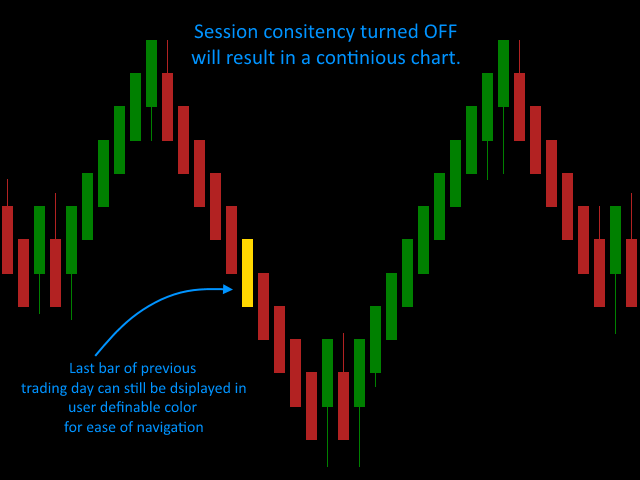 Apply offset to first Renko (plus offset value). Synchronize first bar's open on a new day (true/false). 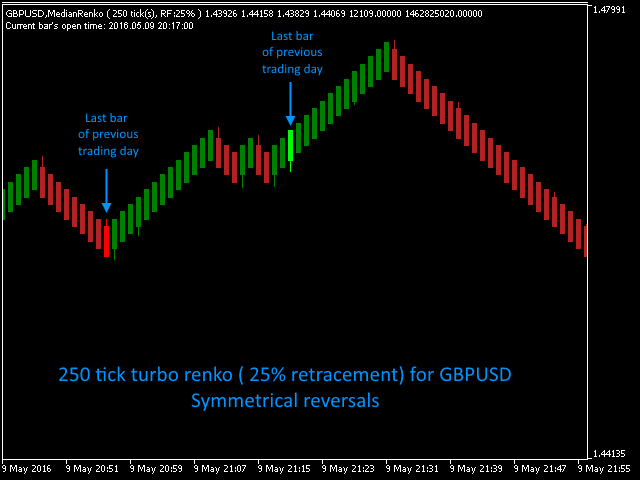 Top/Bottom padding (0.0 - 1.0) - used to set the margins above and below the visible high & low of the visible Renko chart. Show Monthly, Weekly and Daily pivot levels plus Daily R1, R2, R3 & S1, S2, S3 (calculated using Classic or Fibonacci method) as well as previous day's High, Low & Close levels with color definitions. Pivot Point calculation method ( (H+L+C)/3 or (O+H+L+C)/4 ). Show current bar's close projections (true/false) + bullish bar projection color and bearish bar projection color. Display current bar's open time along with bar size and retracement factor (true/false) + Current bar's open time info color. Use sound file for bullish alerts (.wav sound file located in MetaTrader 5 \Sounds folder). Use sound file for bearish alerts (.wav sound file located in MetaTrader 5 \Sounds folder). Settings for first MA - 3rd MA. Show Channel (None, Donchian Channel, Bollinger Bands, Super Trend). Donchian Channel period of averaging. Display as bar chart (true/false). Indicator used in EA via iCustom() (true/false) - Set this to true only when calling the indicator from an EA, another indicator or Script. The first 5 settings are used for defining the type of chart that should be displayed and the next three are utilized for optional synchronization of chart's starting point for maximum consistency. The following settings are used for turning ON/OFF various information on the chart to suit individual needs. These are followed by settings are used for custom alerting of new bars and new bar reversals. Finally the last settings enable the trader to add 3 custom Moving Averages and a Donchian Channel, Bollinger Bands or Super Trend channel to perform technical studies directly on the Median Renko or Turbo Renko charts. I am looking for the EA you made for this indicator. Very useful. I totally recommend it! This is a great indicator. I use it every day and have for a long time. Some of my trading strategies are outlined on my profile page with shared charts. Trying to RE INSTALL it on a new computer and it wont work... THe only path to install is through the link (install on the plataform) but it wont work. Simplesmente NÃO CONSIGO instalar o indicador...ao tentar instalá-lo, aparece um "MedianRenkoOverlay_Trial" (versão TRIAL???) no Navegador, e ao arrastá-lo pra janela do gráfico, também não entra!!! Gostaria de uma solução pro meu problema!!! Artur, thanks for the great indicator. I liked the communication with the author. Artur answered all my questions. 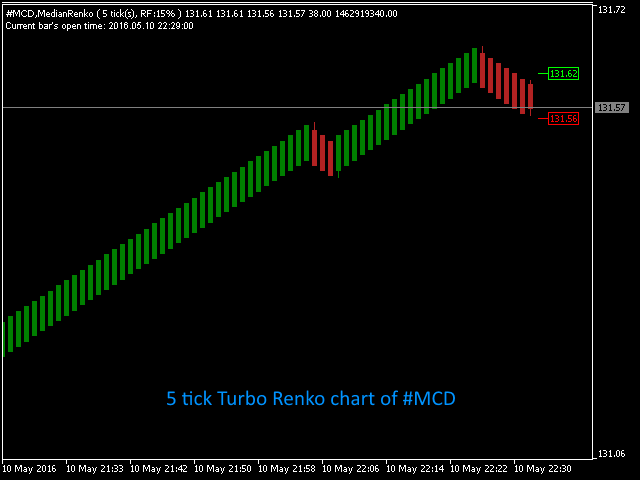 Maybe this is the best Renko indicator and realy best Renko on Metatrader. Excellent work and thanks again! 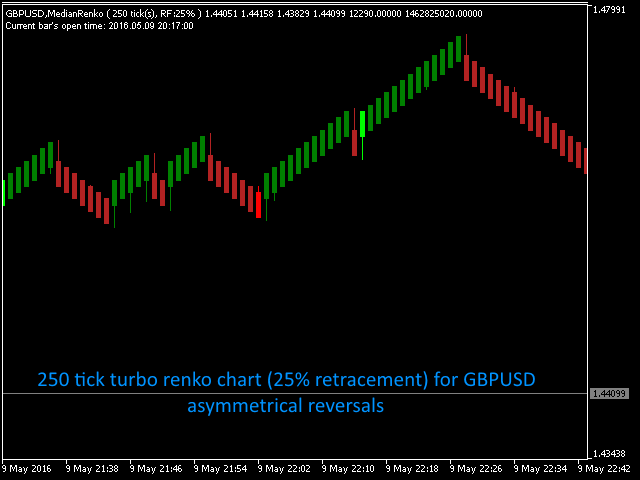 A good implementation of the Renko, but without the histograms of tick and real volume it is not very practical. Great indicator, the developer is very responsive. The developer is very responsive to feedback and has made many improvements in the short time. Bug fix: Fixed backtesting bug. Version 2.00 uses real tick data to build and update the charts. Added new input: Indicator used in EA by iCustom() (true/false) (Prevents incorrect shifting of objects on chart when indicator used in an EA). Added sending new bar/new reversal bar notifications to a smartphone via MetaTrader app. Added: New "Show wicks" (true/false) option for enabling/disabling display of wicks on candles. All custom chart types are now displayed as an overlay on the main chart, so you can use visual order placement and modification directly on the chart. Bug fix of "Buffer overrun" on indicator startup when starting MT5 after few days of inactivity.